THIS ITEM IS NOT AVAILABLE AT PRESENT. WE WILL NOT BE GETTING ANYMORE Star Wars Episode VII The Force Awakens All Characters Poster 20 Ounce Ceramic Mug. From the Star Wars The Force Awakens collection by Silver Buffalo. Star Wars Episode VII The Force Awakens All Characters Poster 20 Ounce Ceramic Mug. 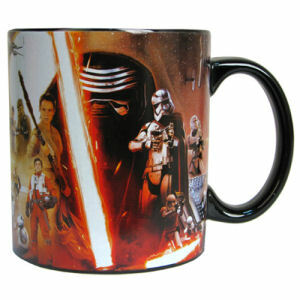 Star Wars coffee mug holds 20 ounces of liquid. Hand wash only. Not dishwasher safe. Do not microwave. Measures approximately 4.5 inches tall and 4inches in diameter.